The End (of the campaign) is here! Dear Seven Worlds fans and Kickstarter backers, today we've got many great news to share! 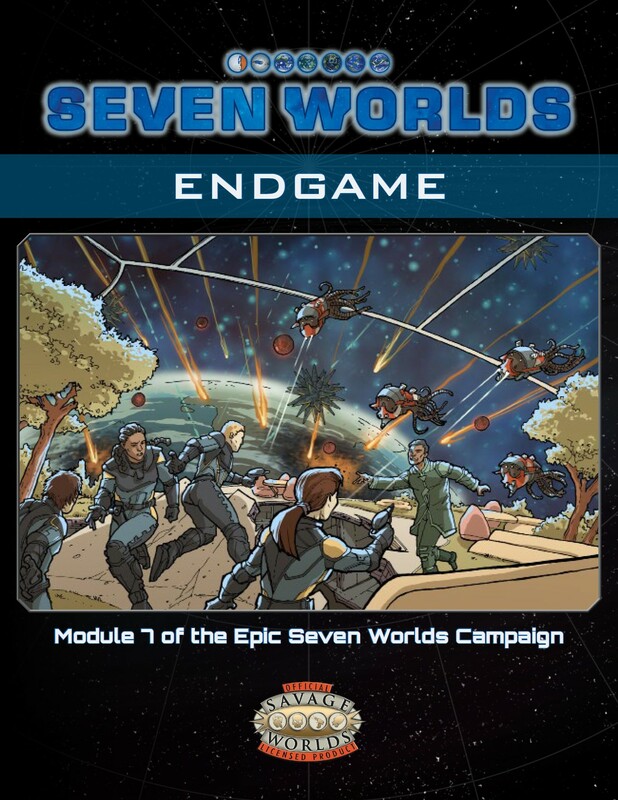 Endgame, the seventh module and amazing conclusion to the epic Seven Worlds campaign, is now available! The future of humanity hangs in the balance as the heroes race against time to save Earth from the fearsome Devourers. As the heroes infiltrate a Devourer base, they finally meet the aliens and discover how truly terrifying their enemies are. Then, while the final assault on Earth rages on, they must face the leader of the Psion Brotherhood and wrest from him the secret that can stop the invaders before the Home Planet is obliterated! Endgame also includes several suggestions and short starters for adventuring in the universe of Seven Worlds once the main campaign wraps up! 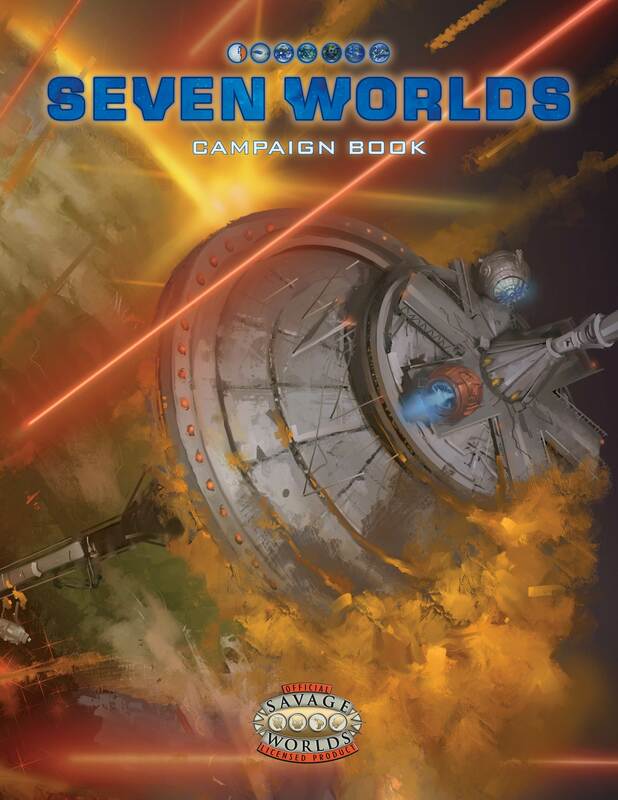 The Seven Worlds Campaign Book PDF is also being released today! An all-in-one, 253-page compilation of all seven modules in the campaign, the Campaign Book is included within the Seven Worlds Campaign Subscription, and is your one-stop PDF for running this amazing adventure! Gamma-, Delta- or Epsilon-level backers, you'll also receive this link in your subscription. If you're not a backer, the Campaign Book is also available for sale within the Subscription. Many people asked me if there was a quick way to leaf through the entire campaign without having to read all seven modules. With the release of the Campaign Book this is more critical than ever, so I'm glad to share that we've posted a Seven Worlds Campaign Overview PDF at our GM Downloads page. This is the best way to understand, in just a few minutes, what the Seven Worlds campaign is all about! The Seven Worlds Setting Guide hardcover and Campaign Book softcover have begun shipping! As explained in backer-only Update #20 (for Beta- and Delta- level backers) and Update #21 (for Epsilon-level backers), up until March 14th we received shipping payments and survey info for the first batch of backer book shipments. The books should begin shipping this week, and in the coming days and weeks you should expect to receive them at the addresses you indicated in your surveys. Did you miss filling the surveys or sending the shipment costs by the March 14th deadline? Don't worry, I'm still going to keep the surveys and payment info listed in the updates, and coordinate new backer shipments approximately once every four weeks. Updates to the Seven Worlds GM downloads site and the product PDFs! Several cool things have been updated recently, mostly based on feedback from you. As mentioned above, we've added a new Seven Worlds Campaign Overview PDF for people who want to understand the campaign at a glance. There's a new errata page for all bugs, typos and improvements found after the books were sent to print. We've applied most (if not all) the known errata to the PDF versions. That's why you can now go to RPGNow or DriveThruRPG and download refreshed versions of the Setting Guide PDF as well as most of the module PDFs. The errata page will tell you what we've updated. I'd like to point out the addition of a new character Edge, Experienced Assistant, to better handle giving a Wild Die to Assistant skill rolls! Many things! First, in just a couple of weeks we expect to have the printed books ready for distribution and sales. Then, we're still working on many of the stretch goals for the campaign. Expect more Seven Worlds news soon. Thank you for all your support, and I hope you enjoy Seven Worlds! A long, dangerous march begins!